For Sermon Slides, check Here. • Prayer was a mark of spiritual life (Acts 9:11). • Prayer was a way of life (Acts 1:14). • Prayer was top priority (Acts 4:24). • Prayer was a gateway to spiritual power (Acts 4:31). • Prayer was one of the foundations of Christianity (Acts 2:42). • Prayer opened the door for God to do great things (Acts 10:9-15). • Prayer changed things (Acts 12:4-17). • Pray for Laborers (Luke 10:1-2). • Pray for Opportunity (Colossians 4:3). • Pray for Clarity (Colossians 4:4). • Pray for Boldness (Acts 4:29). I will pray for Operation Christmas Child this season. I will pray for evangelism to take place across the room, street, and sea. I will pray for opportunity, boldness, and clarity to share the gospel. What are some valuable lessons you have learned about prayer? How do you feel about Operation Christmas Child? How comfortable are you with evangelism? What prevents you from praying for opportunity, boldness, and clarity? Spend some time praying for the lost. 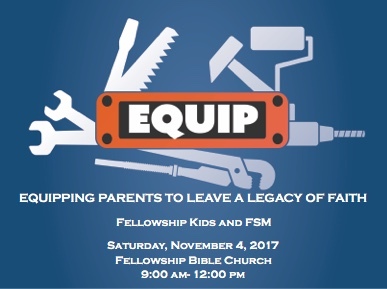 Parents, don’t miss out on this opportunity, coming up next week, to get practical and biblical guidance from special guest speakers on such topics as Discipleship in the Home and Crucial Conversations to Decrease Worry & Increase Coping Skills. Speakers include Danny Hinton and Donna Seal. Breakout Sessions led by and include: James Guinee, Cathy Lee, and a Special Needs Panel. Child care will be provided. Sign Up Here. Contact Heather McKinney for questions or more information. Family Worship Sunday Parents, next Sunday, November 5 will be our Family Worship service, offering us the chance to come together before the Lord and model our faith for our children as we worship, pray, and partake of communion as believers of all ages. Note: we will not have our usual Fellowship Kids or FSM services since we will be worshiping together. Contact Heather Fulmer or Heather McKinney for questions or more information. One Cry Prayer Gathering at Fellowship Tuesday, November 7, believers and area churches from across Conway will be gathering together here at Fellowship to pray for God to move among the nations. Upcoming Girlfriends Gathering Ladies, if you’ve been looking to connect with other women here at Fellowship, we invite you to join us on Thursday evening, Nov. 9, 6:30–8:30 PM, as we discuss the topic of how to process grief and sorrow in our walk with the Lord and hear from some encouraging speakers. Gathering will be held at the home of Becke Stuart (3145 Windsong Ln.). Visit the Connection Center for more information. We hope to see you there! FSM MIddle School Retreat Coming up November 17–19, Fellowship Student Ministries’ Middle School Fall Retreat offers students the chance to get away and connect relationally with God and each other in an intentional setting. Cost for the weekend is $85. Sign up by clicking Here. Operation Christmas Child shoeboxes are available in the atrium for pick up. Please take some of these beautifully wrapped boxes to fill and please share some with your family, neighbors, and co-workers for them to fill as well. The GO Store (807 Court St.) is a great resource for shoebox supplies. Remember our goal for this area is 30,000 shoeboxes and our FBC goal is 6,200! Operation Christmas Child is one of the biggest endeavors we undertake as a church family and we want everyone to have the opportunity to follow God’s mandate to take the gospel into the world – a shoebox does exactly that! Extra information brochures as well as extra Boy/Girl labels can be picked up at the Connect Center. We also need many hands to run our Drop Off location during National Collection Week. Click Here to sign up for a time slot and view available opportunities.